Whether you’re chartering a private flight to Los Angeles, Palm Springs, San Diego, or anywhere in between, there are dozens of private jet airports in Los Angeles and Southern California for your private charter flight. Corporate flyers can strategically choose to land at a specific airport to arrive closer to their meeting; VIP travelers can arrive and depart quickly and discretely for events and getaways; leisure flyers may find it more cost-effective to land at an airport outside of their destination, and enjoy a scenic route while heading to their resort. Where do private jets land in Los Angeles, CA? Check out more details below on the top private airports in LA, San Diego, and Southern California. Owned and operated by Los Angeles World Airports, (VNY) Van Nuys Airport is one of the busiest general airports in the world, and the most popular private jet airport in LA. Despite this fact, it still offers great convenience and anonymity to flyers that wish to maintain a low profile. Van Nuys also offers a non-stop bus service straight to LAX for clients who’ve parked their cars there. Owned and operated by Los Angeles World Airports, (LAX) Los Angeles International Airport is the largest airport in California and the third busiest in the country. Shuttles connect the 9 separate terminals. It’s conveniently located, only taking about 30 minutes to drive to downtown Los Angeles. (BUR) Bob Hope Airport is owned by the Burbank-Pasadena Airport Authority. At about 3 miles outside of downtown Burbank, (BUR) Bob Hope Airport is extremely well placed. And even more conveniently, it has a direct and non-stop rail connection to Los Angeles. It’s also known for offering exceptional security to flyers, as it has its own police force on site. (SNA) John Wayne Airport is an international airport, that actually lies a bit south of Santa Ana in Irvine. It was previously known as Orange County Airport, but was named in honor of John Wayne the actor upon his death. With over 10,000 flights per calendar year, it is categorized as a primary commercial service airport. It’s also the only commercial airport in Orange County. City owned and open for public aviation, (LGB) Long Beach Airport was known previously as Daugherty Field. It lies approximately 3 miles northeast of downtown Long Beach, California. Due to stringent noise ordinances, LGB is a small and low traffic airport; only 66 flights are permitted each day. (ONT) LA/Ontario International Airport, commonly referred to as Ontario International Airport, is located 2 miles east of Ontario in San Bernardino county. It’s about an hour drive to Los Angeles as well. It caters to approximately 6 million passengers annually, and is generally quite busy. It’s currently owned and operated by Los Angeles World Airports or LAWA. About a mile west of downtown Oxnard, California, (OXR) Oxnard Airport is a county-owned airport that’s open to the public. It has one medium length runway made of asphalt and runs an average of about 55,000 operations per year. Oxnard Airport encompasses about about 200 acres of land. Originally named Clover Field, (SMO) Santa Monica Airport is about 2 miles from the Pacific Ocean and about a 20 minute drive from Los Angeles International Airport. 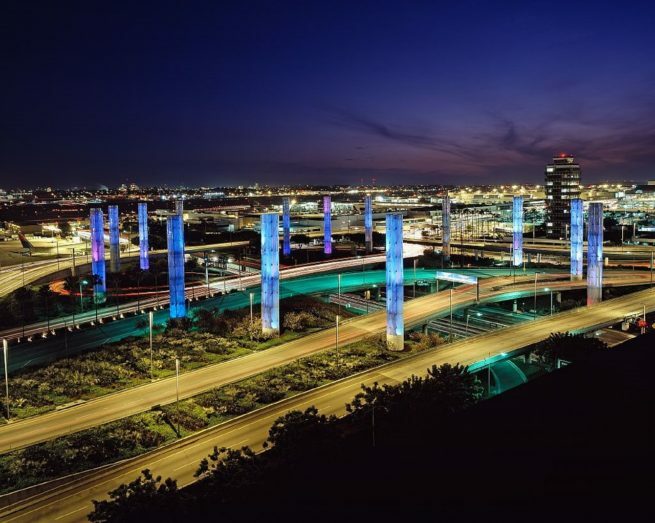 It functions mostly to relieve a bit of the congestion at Los Angeles International, and is consequently significantly less busy; it only handles about 300 operations a day. The SMO airport received a runway reduction down to 3,500 feet to limit air traffic as they try to phase out the airport. Also known as Jack Northrop Field, (HHR) Hawthorne Municipal Airport is close to the Pacific Ocean and sits about a mile outside of Hawthorne city. It only has one concrete runway, and it occupies about 80 acres of land. It’s not particularly busy due to its small size, but this only adds to its convenience and anonymity. San Gabriel Valley Airport was known as (EMT) El Monte Airport until November 2014. It’s located in Los Angeles County, about a mile north of El Monte. It has one runway made of asphalt and covers approximately 100 acres. The airport is operated by American Airports Corporation. (TOA) Zamperini Field was known previously as Torrance Municipal Airport . City-owned and public, this airport lies about 3 miles outside of Torrance in Los Angeles County. It takes up about 506 acres and boasts two asphalt runways. There is only one terminal, and it only has a vending machine and a small patio with some chairs. (SZP) Santa Paula Airport is a privately owned, public use airport located just southeast of the central business district of Santa Paula. The airport exclusively serves privately operated aircraft with no scheduled commercial service. A helipad is available as well. Opened in 1970, (APV) Apple Valley Airport is open to the public and lies about 3 miles due north of Apple Valley, California. APV has 2 asphalt runways for general aviation use. Apple valley airport is small and secluded, and ready for you to land your private chartered flight. Owned and operated by the City of Fullerton, (FUL) Fullerton Municipal Airport lies in southwest Fullerton off of Commonwealth Avenue and is of medium size. At only 86 acres, Fullerton Municipal Airport does not obstruct the surrounding residential areas over-much. As it is not particularly busy with commercial flights, private pilots favor this airport for its proximity to local attractions. (PMD) Palmdale Regional Airport has been managed by the Palmdale Airport Authority since 2013. It’s on the smaller side with only one terminal and a hangar. However in contrast to the lack of facilities, PMD boasts two runways that are each of two miles in length, and built to withstand earthquakes of up to an 8.3 on the Richter Scale. County-owned, (CNO) Chino Airport lies about 3 miles southeast of Chino proper. It isn’t particularly busy due to its proximity to LA/Ontario International Airport. Its main function is to relieve the other airports congestion by a bit. Even though it isn’t very busy, Chino airport boasts 3 asphalt runways on 1097 acres of land. About 7 miles west of Sanata Barbara proper, (SBA) Santa Barbara Municipal Airport is the closest airport to the University of California, Santa Barbara. With 21 commercial operations daily, the airport caters to over 710,000 passengers annually. This airport is extremely popular for private chartered flights as well, and has facilities that support such clients. A leading destination for corporations and businesses, (RAL) Riverside Municipal Airport caters to a very affluent clientele. Offering uncongested airspace and a noticeable lack of noise regulations, this airport is set for growth. RAL provides immediate access to downtown Riverside and the rest of the region. (MHV) Mohave Air and Space Port is a certified spaceport and licensed for horizontal launches of reusable spacecrafts. It serves primarily as a testing facility for new civilian aircrafts. Many companies operating on the cutting edge of technology use this port for testing. However it also reserves a few slots a day for private flights. Small and primarily for use by the public, (RIR) Flabob Airport is about 3 miles northwest of downtown Riverside. Flabob is surrounded by a self-described aviation town, in which the residents take aviation as a hobby. There are slots throughout the day for you to land your private chartered jet as well. (REI) Redlands Municipal Airport is about two miles northeast of downtown Redlands. It caters to San Bernardino County, and has one runway. It’s currently being used for several purposes; it acts as a fueling station, flight training school, and hosts several aircraft refurbishing establishments. (SBP) San Luis Obispo County Regional Airport services San Luis Obispo County for the most part. It has a few flights a day that usually go directly to Los Angeles, Phoenix, or San Francisco. It has other facilities for its less used services as well. There are several slots open daily for private and executive flights. Located just outside of San Luis Obispo, it’s a great port to land your private chartered flight. About 4 miles northeast of the downtown area of Paso Robles, (PRB) Paso Robles Municipal Airport is used mainly for general aviation purposed. The City of Paso Robles owns the airport outright and -after setting aside 1,300 acres- installed it with two runways and a helipad. This airport is used exclusively for private chartered flights and will provide excellent anonymity to those who should require it. San Diego International is the busiest single-runway commercial airport in the US, surpassing the 20 million passenger mark in 2015. It’s also the second-busiest single-use runway in the world, a spot held by Gatwick Airport. (SAN) San Diego International Airport is operated by the San Diego County Regional Airport Authority. County-owned public airport located in El Cajon, 10 miles northeast of downtown San Diego. (SEE) Gillespie Field was originally used to train parachute battalions during WWII, turned over to the county for general aviation in 1946. Home of the restoration facility for the San Diego Air and Space Museum, which is open to the public. Public airport located six miles north of downtown San Diego, and utilized by the San Diego Fire Department as an aircraft base. (MYF) Montgomery Field, also known as Montgomery-Gibbs Executive Airport, features three runways, along with one public and private helipads. Located in the Otay Mesa neighborhood just 1.5 miles away from the California/Mexico border, and 13 miles southeast of Downtown San Diego. Formerly known as Naval Auxiliary Air Station Brown Field, (SDM) Brown Field Municipal Airport serves today as a civilian reliever airport and a port of entry from Mexico. Public airport located 3 miles southeast of Carlsbad. (CRQ, CLD) McClellan-Palomar Airport is owned by the County of San Diego, and is used for general aviation. It was the 4th busiest single-runway airport in the United State during March 2013. For more information on private airports near Los Angeles, give us a call at 1-888-987-5387. No matter how you plan on arriving in LA, our private aviation team is available for you 24/7 to go over all of the options and questions you may have while arranging your private flight to Los Angeles.